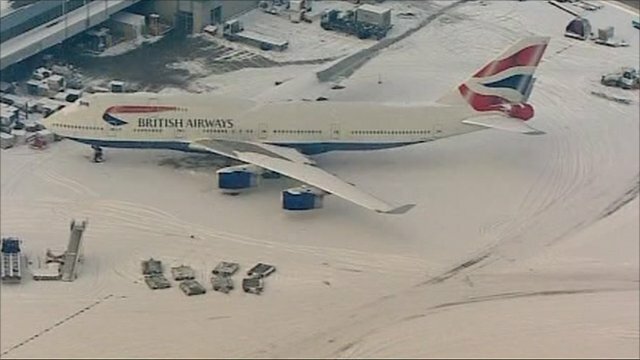 Birds-eye view of snowy Heathrow Jump to media player Our transport correspondent Richard Scott is in the skies over Heathrow and we can get the latest from him live in the helicopter now - Richard how is it looking? 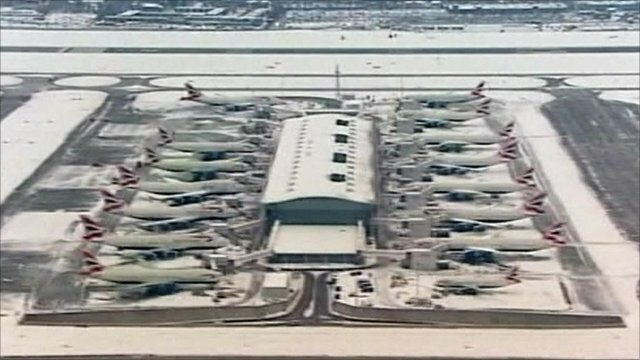 Airport operator BAA have told people not to travel to Heathrow Terminals 1 and 3 as they cannot accept any more passengers. Continuing freezing conditions and snow have caused huge disruption for arriving and departing flights. Thousands were forced to spend another uncomfortable night at the airport after few planes got off the ground. Richard Scott took to the skies over Heathrow for a birds-eye view of what should be the UK's busiest airport.